1060 aluminum alloy belong to the 1000 series aluminum which also called pure aluminum alloy, in this series, the aluminum content is very high, to 1060 aluminum, the aluminum alloy content can reach 99.6%, in this series, 1050, 1060, 1070 and 1100 aluminum are the most used alloy. 1060 aluminum mirror sheet is a typical product, it is similar to 1050 aluminum mirror sheet, they are all produced by rolling, grinding and other methods. 1060 aluminum sheet has excellent mirror surface and usually produced in the form of sheet. If the thickness is thin or the customers required, it can also be produced in the form of coil. 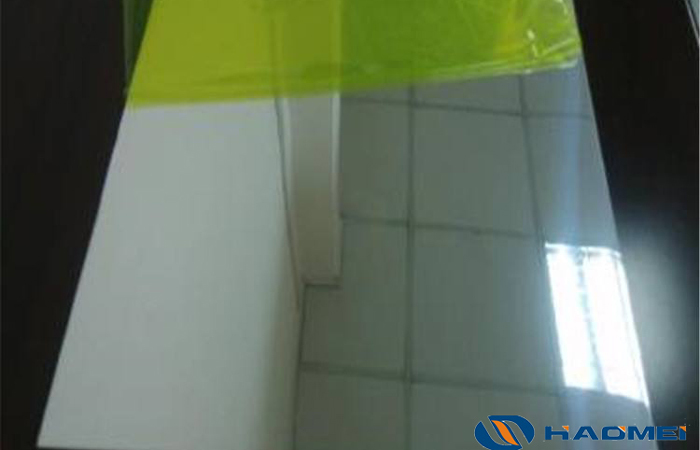 In order to protect the surface of 1060 aluminum mirror sheet, the factory usually add a layer of film on the surface, which can ensure the mirror surface from anodized and dirty. If we touch the surface after pill off the protect film, there will be fingerprint on the the mirror finish, when we use cloth to warp it, the fingerprint will loss and the surface will be clean again. This also can be a method to judge if the 1060 aluminum mirror sheet has high quality. 1060 aluminum mirror sheet mainly applied in the products which do not have high requirements on the hardness, such as building exterior decoration, high-rise and factory wall decoration, lamp cover, clock face and disk, decorations, reflective appliances and so on. Haomei Aluminum supply aluminum products for more than 20 years, we have advanced processing line which can guarantee the quality, we have many professional staff who can guarantee the service, 1060 aluminum mirror sheet is one of our most famous products, free quote and sample are available, please contact us if you have any need.